Ferns are fabulous houseplants. Their fronds offer a wide variety of colors and textures, and they come in a wealth of shapes and sizes. They’re efficient at removing VOCs and indoor air pollution and most varieties look right at home in your home (or office), no matter what décor style you embrace. Despite these lovely qualities, ferns have something of a finicky reputation among some gardeners. Use these tips to ensure success with beautiful ferns indoors. First, ensure your ferns enjoy average, or better yet, above-average relative humidity levels. This can be a challenge if your home or office is heated in winter. Furnaces can drive humidity to near desert levels – not the environment most ferns enjoy. 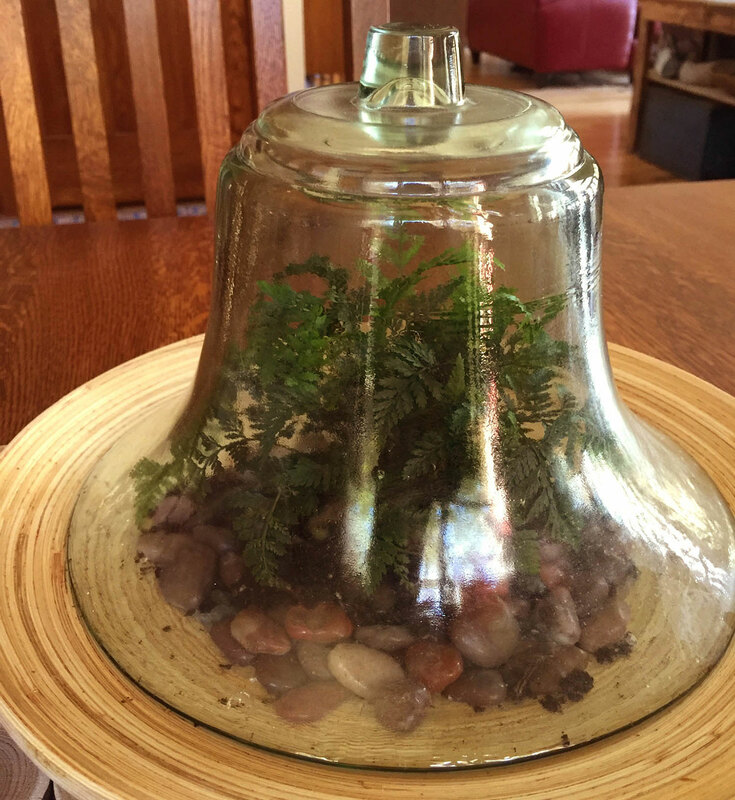 Grow your ferns in terrariums. 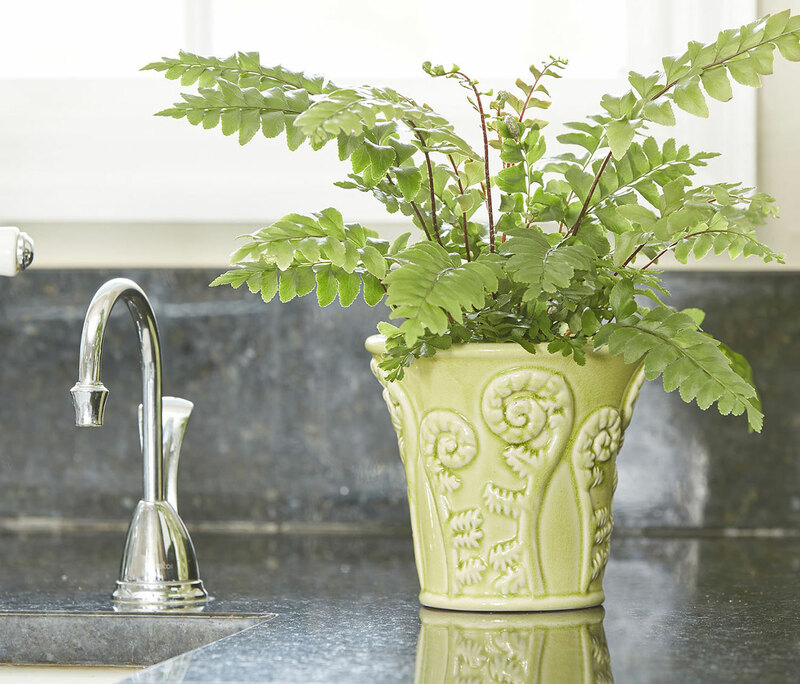 Display your ferns near sinks or showers in kitchens or bathrooms where there’s naturally more moisture in the air. Group your ferns with other houseplants. All plants add water vapor to the air as they breathe (just like people do). Employ the pebble tray technique, where you have a wide, shallow dish filled with water and pebbles. The bottom of your fern’s pot should sit on top of the pebbles, just above the water (so the ferns don’t stay wet). Get a small humidifier and place it near your collection of ferns. Many houseplant ferns are less tolerant of drying out than other more traditional indoor plants. It’s best to keep their potting mix slightly moist all the time, but not wet and soggy for extended periods. That may mean watering a little more frequently than you’re used to, but with a little less water each time. Wondering what exactly “slightly moist” means? One good analogy is your potting mix should be about as wet as a well-wrung sponge. Most ferns hail from understory areas in forests where they don’t get direct sunlight. That’s good news for our homes and offices because it means these beautiful plants don’t necessarily need bright light to thrive. Direct sun, especially in the afternoon (and particularly if you live in a hot-summer region), can easily sunburn their fronds, causing a bleached look and brown, crispy edges. While indirect natural light works, artificial lights – such as fluorescent shop lights – can also be used with great success to grow lush, beautiful, and healthy ferns. The exact amount of light depends on variety, but 10 to 12 hours of artificial light is a good general place to start. When we see a plant that’s not doing as well as it once did, our instinct is to try to fix it. But avoid moving your ferns around a lot. In nature, they don’t change their environments, so when you move them from one place to the next, it can cause a little stress. That stress can make any other issues with your ferns worse. Try to determine why your fern isn’t thriving and only move your plants from place to place if you have to. Find the perfect fern varieties for your home at CostaFarms.com.